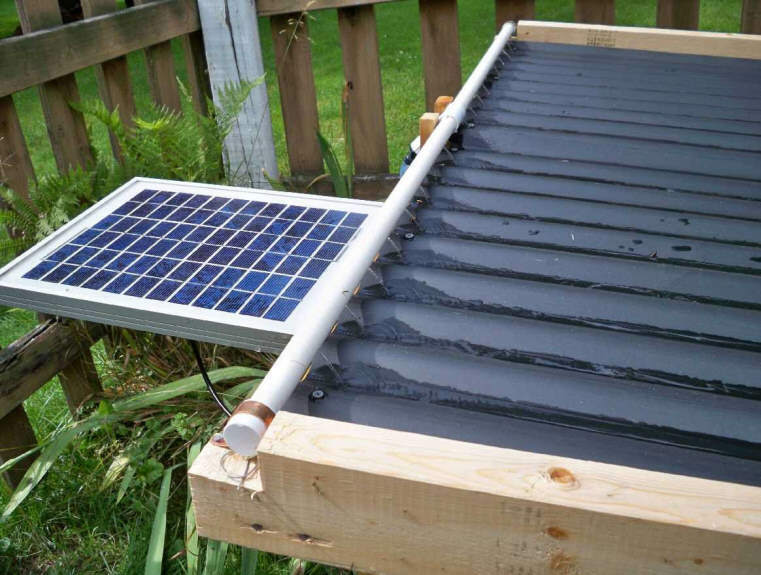 This is a nice simple, cheap, and durable way to ground mount PV panels. 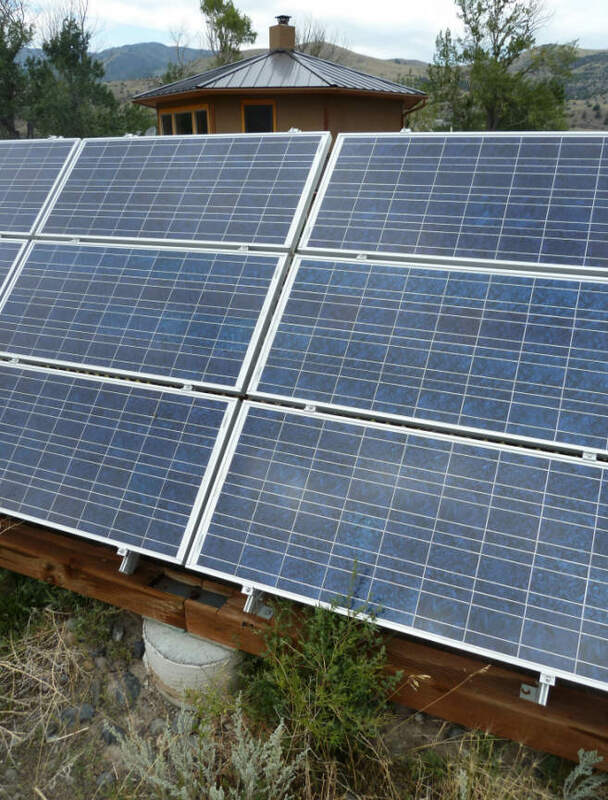 The PV panels are mounted to commercially available aluminum rails made for easy mounting of PV panels. There are two of these rails for each of the sets of 3 panels. 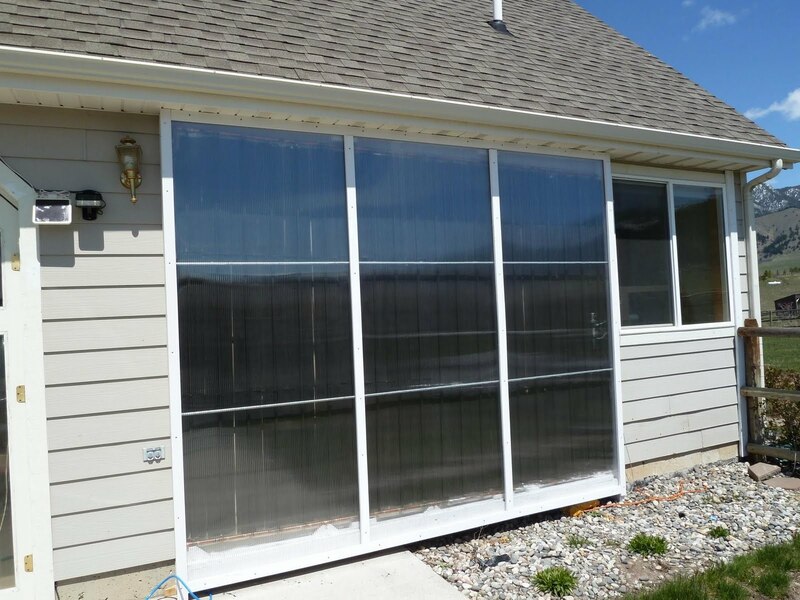 The rails are supplied by companies like IronRidge or Unirac. The front end of the rails are supported by a 6 by 6 treated timber which runs the full width of the PV array (with one splice). 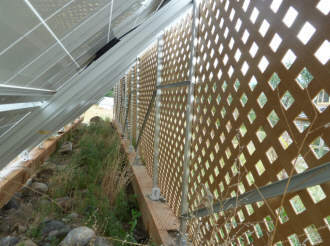 The back of the rails that the PV panels are bolted to are supported by vertical aluminum legs, which are in turn supported by a 2nd 6 by 6 treated wood beam that runs along the full width at the back of the array. The tilt of the panels is set by the length of the vertical legs. The two 6 by 6 timbers are in turn supported by concrete piers at about 8 ft intervals. Located in the Paradise Valley south of Livingston, MT -- one of the most beautiful valleys in MT. 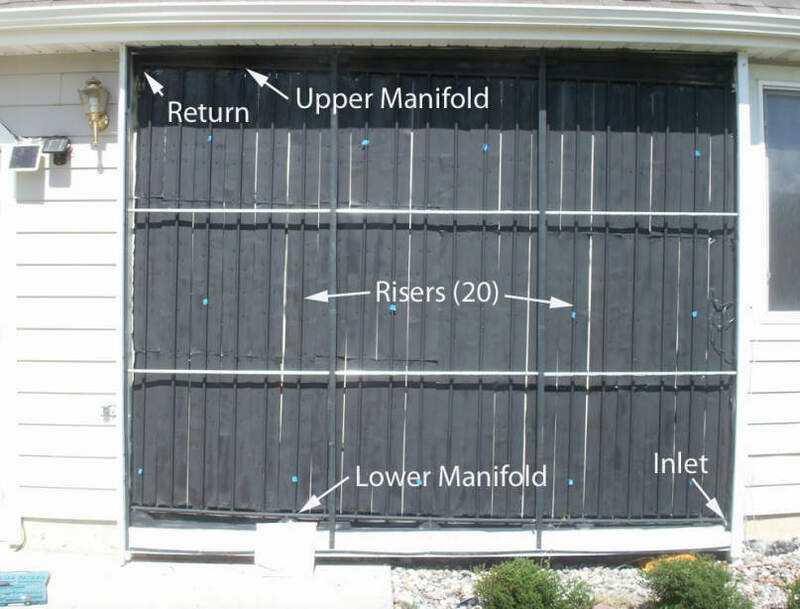 Solar space heating systems often use wide solar collectors in which a large diameter bottom manifold distributes a heat transfer fluid (often water) to a large number of vertical risers. The risers are equiped with fins to absorb the sun and transfer the heat into the water flowing in the risers. The heated fluid is collected by an upper manifold and returned to the storage tank. The collectors are often arranged so the inlet is on one lower corner and outlet is on the opposite upper corner in order to improve the evenness of water distribution to the risers. This test attempts to assess how even a distribution of fluid to the risers this design achieves. If the distribution is uneven, then the efficiency of the collector will suffer. Even though this design is very common, there is surprisingly little data that I could find on the evenness of the distribution. The picture shows the my 11 ft wide collector used for the test. Same collector with glazing removed to show manifolds and risers. The test was done by removing the glazing from the collector, and with full sun on the collector, and normal fluid flow through the collector, the temperature of each riser was measured with an IR gun style thermometer. The idea being that if a good fluid distribution is being achieved, the risers should all have a similar temperature profile with the lower part being near the tank temperature, and the temperature gradually increasing as you go up the riser. The truncated table above shows the results -- see the full report link below for the full table -- there are 20 risers in the full table. Happily, the distribution is pretty even, with most risers showing similar temperature patterns. There are variations, but probably not enough to seriously effect efficiency. It does appear that the evenness of the distribution can be effected by relatively small changes in the details of how the plumbing is done. Have a look at the full report for more details on this. If you have additional data on riser flow pattern tests or analysis, please let me know. 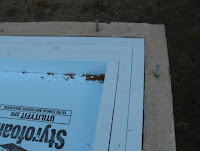 - The collector housing (box) is made from metal instead of wood. - A selective finish is applied to the absorber for better performance. - A thermally conductive copper adhesive bond absorber fins to riser tubes. 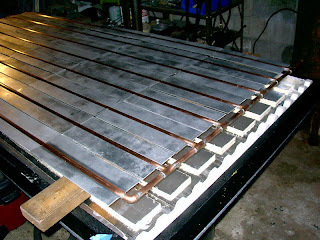 - Fins are formed of heavy gage aluminum using a press. - Barrel storage tank with PEX custom wound heat exchanger coil. This is one of Paul's collector fins. Very nicely formed using tools he built. He used Permatex Copper Spray a Gasket to adhere and thermally bond the aluminum fin to the copper riser pipe. This may give better thermal performance -- something I hope to test fairly soon. The fins were painted by the moderately selective paint called Thermalox -- this paint is available in easy to apply spray cans and gives a lower emissivity finish that should reduce collector heat loss and improve performance. This is Paul's collector -- it uses a metal frame made from galvanized steel stud "rail" material. 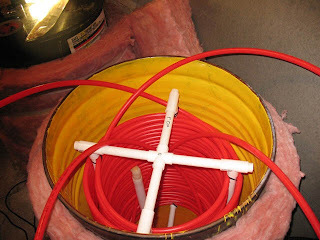 To store the collected solar heat, Paul uses two barrels, each with a new version of the coil of PEX type of heat exchanger that uses two coils of small diameter PEX pipes in parallel to transfer heat from the solar storage to the potable water. 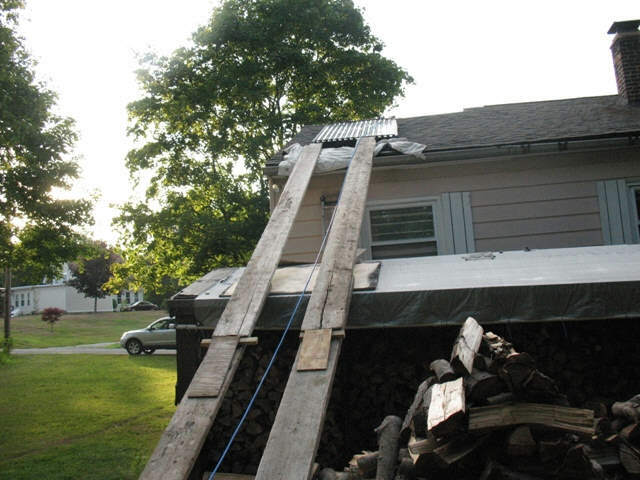 John Canivan's JC-SolarHomes website has quite a bit of material on using drums for solar heat storage. Ken was having trouble finding a good clothes drying rack in the store, so he designed and built this very nice solar clothes drying rack. He provides full construction details, plans, and pictures. He even included plans for both a deck mounted one and a ground mounted one. The rack is built entirely from common hardware store materials -- 2 inch conduit for the post, and plastic deck wood for the arms, ... You should be able to buy all the materials locally. 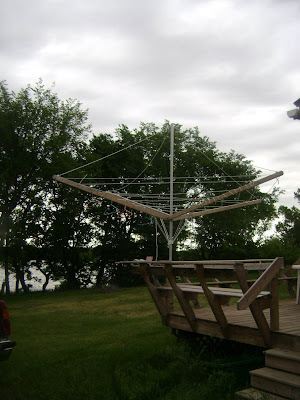 All the materials are highly weather resistant, so you should get a good life from the rack. One of the nice features of the rack is that it allows you to place clothes from the washer on hangers, and then hang the hangers on the rack. The dry clothes can then be moved directly on the hanger to the closet. 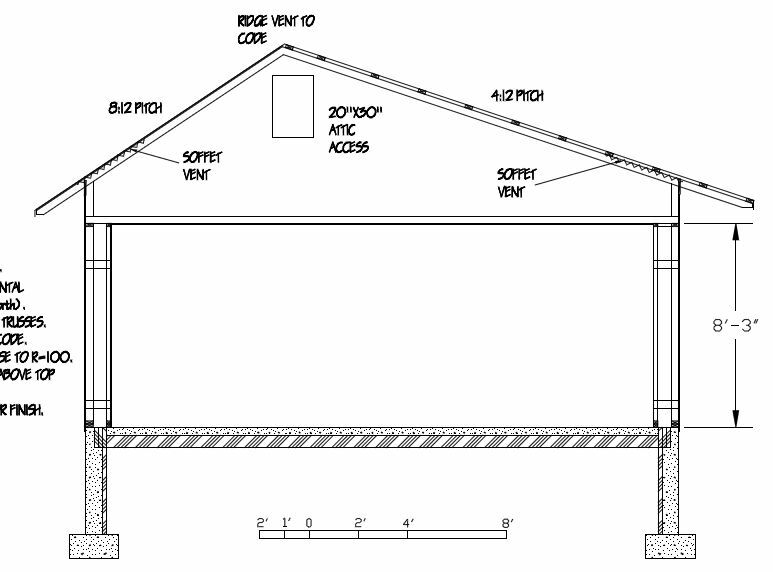 Ken provides dimensioned drawings for both a deck mounted and ground mounted version of the rack. 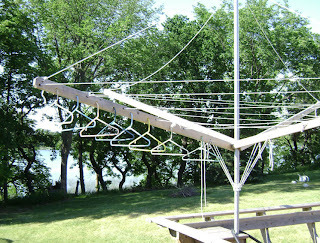 With the deck mounted version, you never have to step off the deck to hang clothes on the rack. 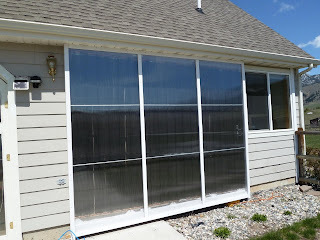 Matt has done a really nice job on this easy to build, efficient, and inexpensive pool heating collector. This is a unique, open flow collector design which reduces cost while still providing high efficiency. 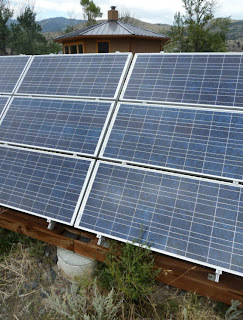 The collector pump is powered by its own PV panel and heats the pool without using any external power source. The collector price comes in at about one third of what commercial pool collectors cost. 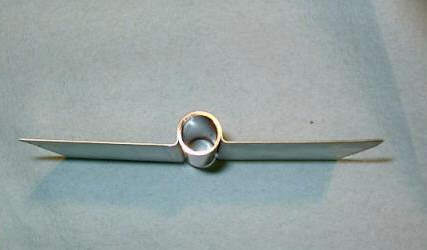 The picture shows the basics of the design. 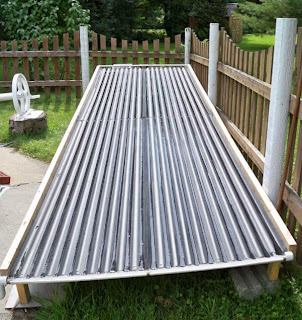 Water is pumped from the pool to a header that distributes a trickle of flow to the each valley of the corrugated metal roofing that acts as the collector absorber. The heat collected by the black metal absorber is collected by water as it flows down the absorber. At the bottom of the collector, the heated water is collected and routed back to the pool. Matt's collector is about 64 sqft and does a good job of heatin his 26 ft diameter octagonal 4 ft deep pool in VT. The total cost of the system was about $260 and the price per sqft of the the collector alone was only about $1.80 per sqft! One very nice feature of the way Matt did this is the PV powered pump that circulates water to the collector. By having a separate pump for the collector, the main pool pump (which uses quite a bit of power) does not have to be run for solar collection. 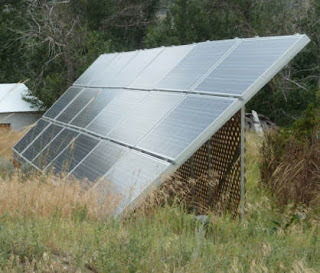 And, by using the PV powered pump, no external power is required for water circulation to the collector. Powering the pump by PV also means that no controller is required, as the PV panel only generates power for the pump when there is sun on the pool area. This collector is in part based on this experiment I did a while back on an open flow design. The experiment includes measuring performance of the collector along with an estimate of efficiency and an explanation for why the collector performs well in spite of some heat loss due to evaporation from the open flow. 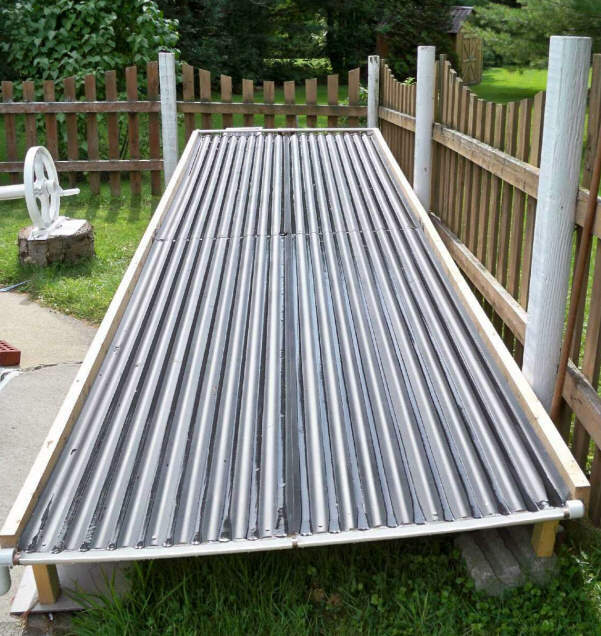 I'm in the process of trying a full scale cooling application using the Solar Shed as described in the link just above. 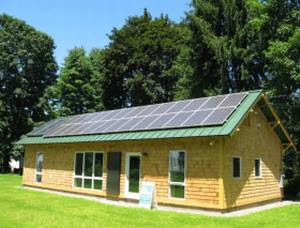 The Montague Urban Homestead designed by Doug Stephens was the winner of the Massachusetts Zero Energy Challenge. The house is a full Zero Net Energy home that generates more power than it uses on a yearly basis. The 5 KW PV system you see on the roof generates all the power for both space heating (via a mini-split heat pump) and for all the homes electrical loads -- it actually generates substantially more power than the home uses on a yearly basis. The house design is very effective but also simple and the home is affordable at $180K. Doug has now made the "as built" plans for the home available as a free download -- thanks very much to Doug for doing this! Some pictures of the home below. 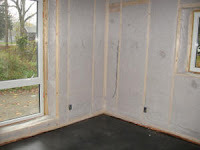 The double stud, cellulose insulated wall provide cost effective super insulation with no thermal bridging. Section showing raised heel roof trusses which allow for deep attic insulation. Double stud walls are also visible. 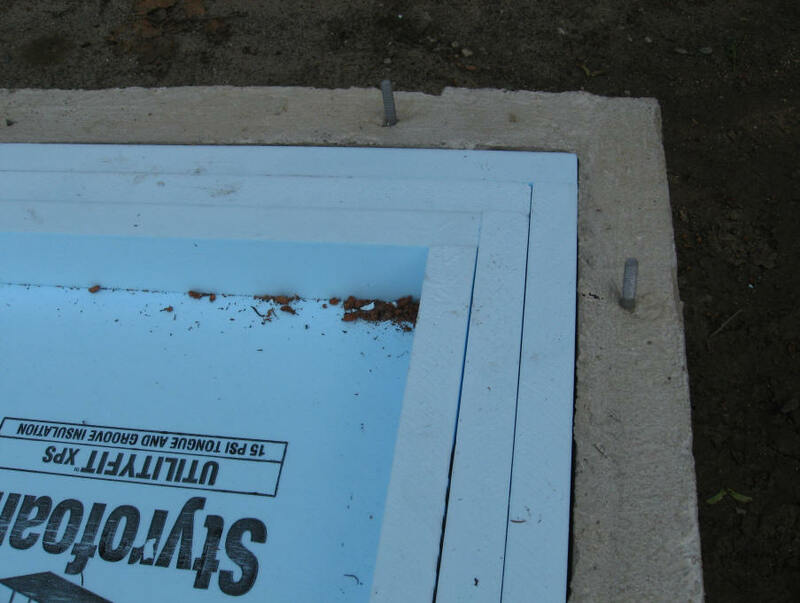 The concrete slab is fully insulated with rigid extruded polystyrene board. This small mini-split heat pump provides all the heating for the super-insulated and well sealed home.